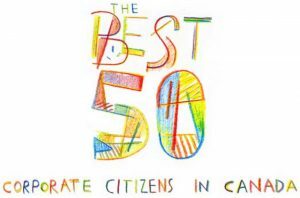 TORONTO – Corporate Knights has once more released its annual list of the Best 50 Corporate Citizens in Canada. Several mining companies that take social responsibility seriously made the cut. Here they are: Cameco Corp. No.5 (with an overall score of 61.3%), Teck Resources No. 18 (53.5%), Kinross Gold No. 19 (52.4%), Suncor Energy No.20 (50.6%), Agnico Eagle Mines No.32 (44.8%), Potash Corporation of Saskatchewan No.43 (40.8%), and Yamana Gold No. 46 (40.1%). Corporate Knights ranks companies in all industry sectors against 12 key performance indicators. The best company on the list, Vancouver City Savings Credit Union, scored only 73.8%. See the entire list at www.CorporateKnights.com.